Eccentric design with unusual tower, with Tudor Revival touches for a catholic school. The Old School closed in 1980 and has been used by different community groups since. 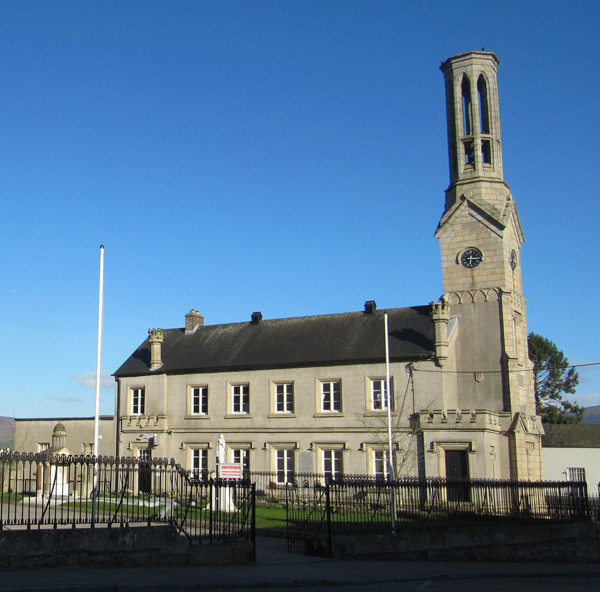 The building is inscribed with the reminder that: “This school house was built in the year 1832, by money left for that purpose by Mrs. Butler, alias Kavanagh, sister to the late Walter Kavanagh, Esq., of Borris and sister also to present Mr. Kavanagh, under of the superintendence of the Rev. John Walsh P.P.” The curious bell tower and corner finials were added in 1899.